Having walked my local neighbourhood as often as I have spying the various fruit trees and goodies growing in gardens, I thought I'd spotted everything edible within a 10km radius. Here's just a bit of what goes on in the area across any given year: apples, oranges, pears (too wild to eat), apricots (too many to eat! ), peaches, loquats, nectarines, lemons, lemonades (the yummy sweeter version), almonds, cherries (too few to eat), mandarins, plums, bay leaves, persimmons, and more. There's also a mountain of parsley. And olives and tomatoes in season and it goes on. I walk and watch the fruit come and go as seasons do. It's a walking meditation. A group of us did a local walking food tour once spotting all that was edible and counted some 35 edible varieties. There are lots of Italians and Greeks in the area. I am blessed. Oh, yes. And figs. Yes, figs. Figs. I'll say it once more. Figs. Doesn't it roll off the tongue beautifully, smoothly, sensually, just as the fig's flesh rolls around the mouth while you mush it against the roof of your mouth and oh my goodness, I'm too excited so can't talk about those anymore. There's even a fig tree on the footpath on my very street. That's public property, you know. I know. I also know that strategic picking makes fruit tastier than ever and that stolen fruit tastes even better - not that I'd know of course. So given I thought I knew the local bounty as intimately as my own backyard, I was surprised, shocked, elated and utterly gobsmacked yesterday to spot a tree laden with this berry-like fruit around the corner. It's on a street I walk at least four or five times weekly. At a very rough calculation, that means I've walked past it some 1583 times since I've lived here and never spotted it. I couldn't understand it. maybe I never walked past while it was in season? But that's impossible. Surely it fruits for weeks? Was it just planted? No, it's huge. A tree rather than a more traditional berry bush. Questions have been plaguing me since yesterday - until now. It just clicked. Of course! The tree is on the nature strip of a house with an orange tree in its front yard. The old man doesn't pick his oranges but lets them fall and rot on the ground, so I do my environmental duty and collect them diligently. I review and monitor that beautiful orange tree every single time I walk by. It was a case of foraging tunnel vision. As for the new discovery, a little research later (questioning the Greek locals who walked by and Googling for Greek-English translations and endless images of berries), it turns out its a mulberry tree. (They go black when they're rip, but they're longer than boysenberries. As for flavour, don't know yet.) I'm so excited. And it's on public property. And the Greeks told me, which Google since confirmed, that the mulberry leaf is fed to silkworms to make soft, silky silk. The lady's mum used to feed it to their silkworms back home in Greece, which were of course kept for making silk. Sweet, huh! I am replete on the discovery and the romance of it all - and my first-ever chat with these Greeks who, naturally, claimed the fruit to be Greek. 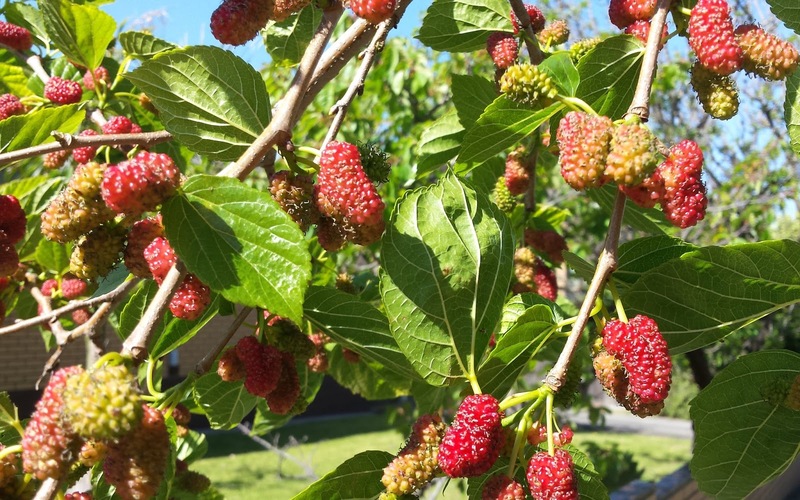 If I'd bumped into Italians, mulberries would be Italian. Who cares about their origins. I am fixated on their current location. And that because netting the tree clearly isn't an option, it's going to be a battle between me and the birds. Look out. Feathers might fly! What's the most exciting thing you've found, or foraged, when out and about?